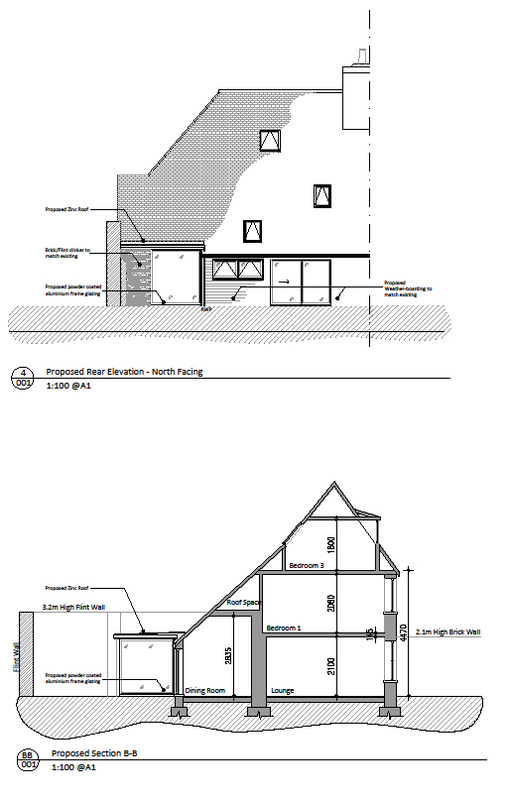 Listed Building Consent Elevation and Section. Situated within the historic village of Minster is a quaint Grade-II Listed C17 cottage. We helped a young growing family maximise their kitchen, dining and garden space. Our scope primarily focused on transforming the rear of the property which contained a medley of dated and cramped interconnected spaces detached from the garden. Key moves on the project saw the internal ceilings vaulted to exaggerate the height over the kitchen and dining area. The rear elevation was rebuilt, insulated and re-clad and features enlarged aluminium windows and a sliding door providing access to a landscaped courtyard garden featuring raised beds and black limestone paving. 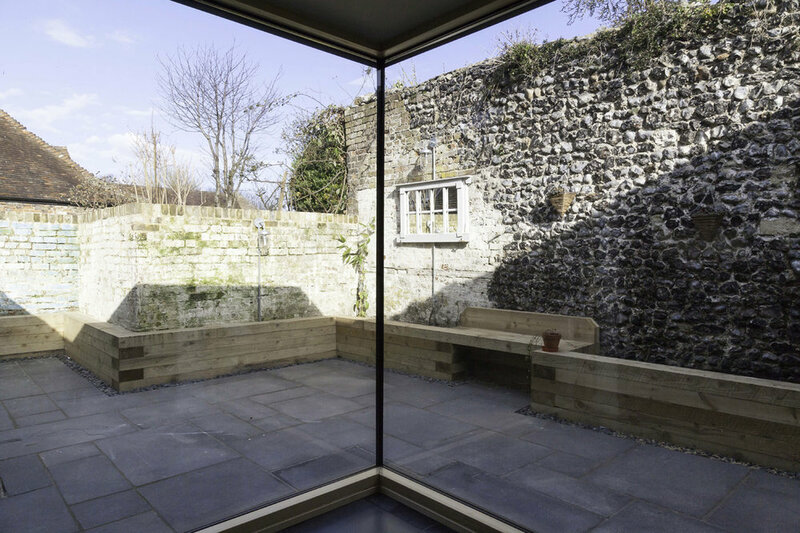 The most striking feature is the full height glass to glass corner extension which projects deep into the courtyard interlinking spaces inside and out. This is achieved by cantilevering the roof above it, removing the need for a post, therefore creating an unobstructed view out. The modern glass juxtaposes the flintwork of an adjoining Abbey wall and the rough sawn black weatherboarding of the cottage and its natural Zinc standing seam roof sits vividly against original Kent Peg roof tiles. Internally a modern country palette of materials, textures and neutral colours were used so as not to overpower the main interventions in what is actually a small but beautifully practical light filled family space.